Suffering from acne and pimples day in and day out is a constant struggle. Not only do patriarchal beauty standards tell you that having acne on your face is some kind of cardinal sin, there are hundreds of creams and products out there that feed on that insecurity and claim to cure your acne in a matter of days. But are they really reliable? Truth is, dermatologists still haven’t been able to pin down a singular definitive cause for acne. It is largely hormone-induced, of course, but the symptoms vary in each person and so, to administer the same shoddily packaged cream for everyone makes the process reductive and sometimes even accelerates more breakouts. Every major skincare product conglomerate will claim to cure you of your acne in weeks with their products, but some work, and many don’t. And that’s because each person’s acne is different and requires different kind of attention. 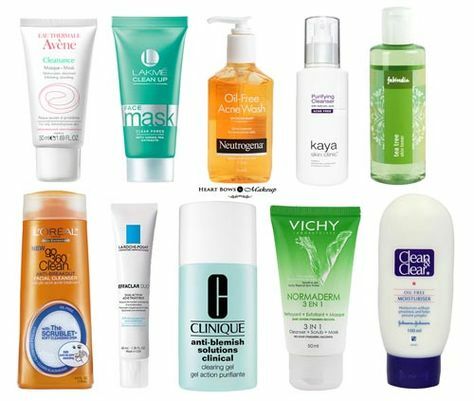 That said, let’s go into some of the main constituents of anti-acne products. So-called “herbal” anti-pimple face washes will usually contain neem extracts, sometimes basil or mint, sometimes tulsi, and so on. By a basic rule of thumb, it is more practical to use these herbal or organic face washes since they are (usually) low on chemicals. However, there are disclaimers here too. Extracts of neem, tulsi, mint, or amla don’t magically clear acne; they purify and disinfect the skin, and that too, when used in controlled amounts. For those with oily skin who are prone to faster breakouts, excessive amounts of herbal face washes (that often contain essential oils) can increase the skin’s sebum secretion and lead to more aggressive acne. Therefore, exercise caution while picking your face wash, always thoroughly read labels and composition percentages. Cleansing is an important process in your skincare regime, and if you use the wrong product to cleanse your skin, it can end up having disastrous results. Like mentioned earlier, there is no singular foolproof cure for acne, but a commonly prescribed chemical used to treat it that yields moderately successful results is Benzoyl Peroxide. In accordance to what your doctor might recommend, benzoyl peroxide can come in the form of over the counter or prescription drugs, or in lotions, creams, and gels. It's believed that this compound works by destroying the bacteria associated with acne. It usually takes at least four weeks to work and must be used continuously to keep acne at bay. However, it does not affect the overall sebum production of skin or the way the skin follicle cells are shed, so when you stop using it, the acne comes back (sometimes more severely than before). But again, it’s important to exercise caution while using a benzoyle peroxide product. Too much of it can cause dry and cracked skin, and sometimes it can also bleach fabrics. A lot of anti-pimple creams and spot correcting products commonly have salicylic acid, which is meant to correct the abnormal shedding of cells. For milder acne, salicylic acid helps unclog pores to resolve and prevent lesions. However, much like benzoyl peroxide, it does not have any effect on sebum production and does not kill bacteria and should therefore be used continuously. However, it’s important to not use too much or too little, because that may end up blocking your pores instead. In combination with other substances such as alcohol and salicylic acid, sulphur is a component of many over-the-counter acne ointments. Although, it usually isn't used by itself because of its unpleasant odour. It's unclear how sulfur works, but it has only a marginal benefit in most cases. Retinol works to keep pimples from being able to form by stunting the growth of bacterial cells and decreasing swelling and inflammation. It’s usually one of the most useful remedies for acne, although, applying it might make the acne get worse before it gets better (because it will first work on the pimples that have already started forming beneath your skin). It must be used continuously and may take 8-12 weeks to get results. Alcohol is a mild anti-bacterial agent, and acetone can remove oils from the surface of the skin. Therefore, these substances are sometimes included in anti-acne gels, creams and lotions. However, these agents dry out the skin, have little or no effect on acne, and are generally not recommended by dermatologists. When it comes to severe acne, the wisest course of action is perhaps to seek out a dermatologist and get prescription treatment. Depending on the specific cases, doctors may prescribe antibiotics, retinoids and anti-bacterial drugs, hormone-balancing medicines, spinolactones, and so on. Your dermatology varies the dosage according to your requirements, and so it is important to heed their directions. When you have acne, it seems as if everyone around you is telling you to try some particular product or the other – and most of them quite expensive. But instead of being easily fooled and giving in to every questionable acne remedy, do your research first, and go to a trusted dermatologist to get yourself checked. Acne is only temporary, so if you treat your skin right, it’ll eventually clear.